Earls Court Serviced Apartments offers some of the most affordable and convenient accommodation on the Gold Coast. There is plenty of shopping a short walk away, and the new G:Link light railway provides quick and easy access to beaches, restaurants and the renowned Gold Coast night life. The Gold Coast University Hospital, Griffith University and Gold Coast TAFE are all within a couple of stops on the G:Link light railway. Click on one of the many landmarks below to view more information. The new $1.76 billion Gold Coast University Hospital has led a major expansion of public health services on the Gold Coast. Located on the corner of Parklands Drive and Olsen Avenue in Southport, the hospital will be one of Queensland's largest clinical teaching and research facilities. It will provide specialised health services that meet the needs of patients as well as the learning requirements of our future clinicians. Made up of seven main buildings, the hospital's design is extremely efficient and will allow expansion to meet future health service needs of the community. Griffith University's comprehensive Gold Coast campus plays host to over 16,500 students from all over Australia and the world. Widely acknowledged for its strengths in Health, Griffith's Gold Coast Campus boasts state-of-the-art facilities, including the $136 million Griffith Health Centre, co-located with the Gold Coast University Hospital. Students can relax at a campus cafe, and enjoy extensive sporting facilities, including an Olympic-standard athletics track, a gym and basketball and tennis courts. There are many handy services right on campus, such as banking, post, medical, welfare and student guild services. The redevelopment of Parklands, Southport will be one of the largest urban renewal projects ever undertaken on the Gold Coast. The redevelopment will provide vital infrastructure for the Gold Coast 2018 Commonwealth Games™ (GC2018) and in the longer-term, it will form the key residential, commercial and retail part of the Gold Coast Health and Knowledge Precinct. The project will include 1200 apartments and townhouses across 30 buildings, and provide accommodation and services to 6,500 athletes and officials during GC2018. Sea World is the premier marine animal park in Australia, offering amazing attractions and rides for all ages. From adrenaline pumping coasters to awesome kid's rides, Sea World offers the best value for money entertainment on the coast. Buy your tickets today! The curriculum at St Hilda’s School offers a modern, innovative and lively learning environment to cater for the diverse needs of young women. The curriculum enables St Hilda’s School to develop an atmosphere where excellence is an expectation. St Hilda’s School Junior and Middle Schools endeavour to implement the Australia Curriculum creatively while providing the fundamentals required to build the foundations for developing the modern young women of the future. The Senior School has developed multiple pathways for young women to achieve their goals and aspirations for the future. Gold Coast Aquatic Centre is a world-class swimming facility located in Southport’s Broadwater Parklands. It will be the swimming and diving facility for the Gold Coast 2018 Commonwealth Games™. This outstanding facility provides many benefits to the Gold Coast and its residents, a place where elite athletes can compete and world records can be broken. TAFE Queensland Gold Coast offers over 300 different courses across a variety of key study areas. TAFE's programs have been designed in close consultation with business and industry. When students complete their studies with TAFE, they will have the necessary skills and knowledge to ensure a competitive advantage when entering the workforce or moving onto further education. Whether a student joins TAFE straight from school or after years in the workforce, they will work with them in the pursuit of their goals. The Gold Coast's world class Broadwater Parklands offers a range of diverse locations and facilities for hire, designed for everything from large scale events to small family gatherings. The centrally located Parklands not only offers magnificent views and wide open spaces for community events, but also offers a number of more intimate locations such as the Pier and the Rooftop featuring the spectacular backdrop of the Surfers Paradise skyline. Whether it's a concert, a corporate function, a wedding or just a family BBQ, Broadwater Parklands has the perfect location to suit your needs. Located in Southport, Pacific Private Day Hospital has been contributing to the provision of high quality care since opening in 2000. We recognise the integral and important role we play as part of the Gold Coast community. Pacific Private Day Hospital has five operating theatres and our friendly nursing staff, health professionals and accredited private specialists foster a dynamic, team-based environment to optimise your care. Situated in the heart of the Gold Coast overlooking the beautiful Southport Broadwater... Australia Fair Shopping Centre is just 2km North of Surfers Paradise located in the centre of the Southport CBD hub. With over 210 stores to choose from, you can get the latest trends for so much less. Not to mention one of the cheapest movie tickets on the Gold Coast at Birch Carroll & Coyle!! Australia Fair Shopping Centre provides parking for over 2,500 cars, with the majority undercover. The State Government has confirmed a funding allocation of more than $12.5 million to introduce a new health precinct in Southport. 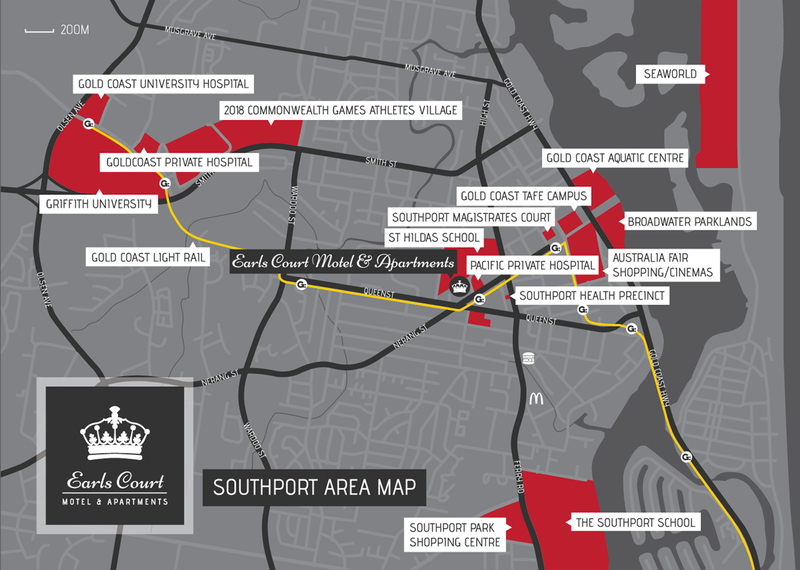 The Southport Health Precinct will be established to provide the community with a “one stop” centre for a range of health and community service in the heart of Southport. Patient-based services in the facility will include Oral Health, Renal Dialysis, Children’s Health, Child Mental Health, Alcohol and Drug Services, Sexual Health and Transition Care. Founded in 1901, TSS is an Anglican day and boarding school on the Gold Coast for boys from Prep Year to Year 12 with boarding available from Year 5. TSS provides a balanced and holistic approach to boys education, with integrated programs of academic and co-curricular with a low student-to-staff ratio. Southport Park offers customers a wide variety of retailers, tailored to meet individual consumer needs including anchor majors Aldi, Target, Woolworths and Woolworths Petrol Station plus over 50 specialty stores. Southport Courthouse is the Gold Coast's major courthouse. It houses courtrooms and chambers for part of the District Court of Queensland, which has jurisdiction to hear petty crimes and civil matters up to A$750,000. © Copyright Earls Court Serviced Apartments 2019. All Rights Reserved. Terms & Conditions | Website by Xtreme Web Design.